Only as good as 80%. US income for men & women, up to 2015. (Click on the image to enlarge) Over this labor day, it’s good time to review what the US men & women earn. US Census data shows women earn only about 80% of what men earn. This has been a hotly debated issue with several high profile cases, including recent lawsuit against Google for systematically paying women employees less than men for same roles. The Obama administration put rules in place to close this gap which President Trump recently rolled back. The wage gap reality has several layers. Despite belief in meritocracy, women do get paid less than men for same jobs as the Google case shows. However, a much larger proportion of women work in lower paying jobs like administrators, aides, teachers, nurses, and social workers. The high paying technology & finance industries are disproportionally male dominated. Nature also doesn’t help women, with their child bearing and raising years conflict with their most productive years. In absence of strong Federal or State incentives, employers simply avoid taking the troubles of doing anything but keep pushing everyone harder, as reported in this New York Times story of unreasonably high demands by Amazon. As some of the previous charts show, women are also more involved in household chores (Aug 28, 2017 & Aug 29, 2017). This is another reason their contribution to workforce lags behind. However, the second chart shows that the earnings of women are steadily increasing. 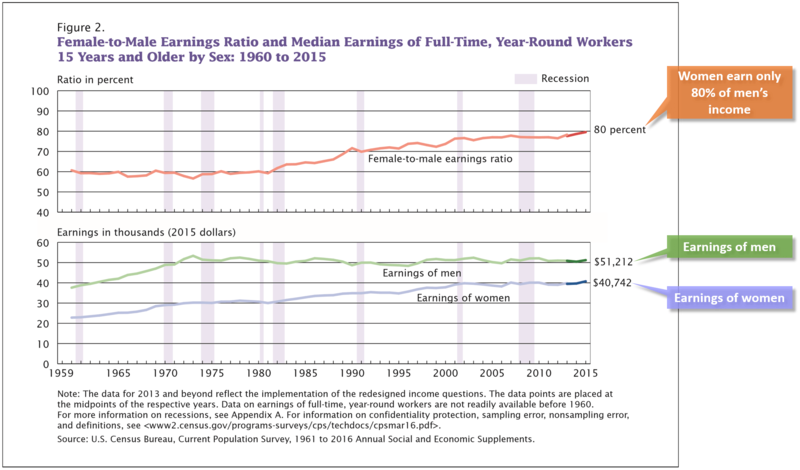 What gets lost in this discussion is that earnings of men have not increased since early 70s. Thus, all the gains made in the household income (Sep 01, 2017) have pretty much gone to women. It’s just a matter of time before the focus from immigrants-stealing-our-jobs moves to women-stealing-our-jobs.